Australian karters James Wharton and Christian Mansell competed in the opening round of the Rotax MAX Challenge Euro Trophy at Genk (Belgium) on the weekend. Competing in Junior MAX, Wharton (FA Kart) and Mansell (OTK) both made the two Finals, Wharton taking 19th then 17th while Mansell finished 33rd then 23rd. Despite both receiving a drop-down bumper penalty in qualifying, Wharton wound up 14th in the 41-kart field with Mansell 16th. Round 2 is at Kristianstad in Sweden from June 8 to 10. 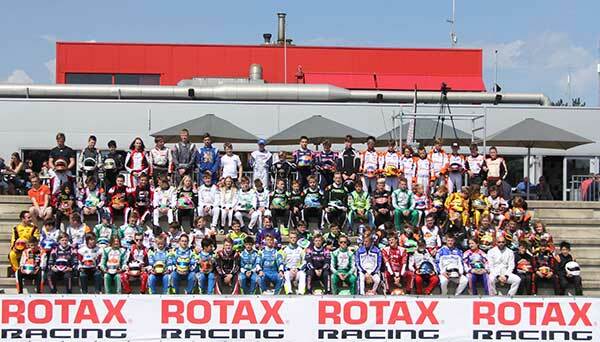 From April 20 – 22, the premiere of the newly-introduced Rotax MAX Challenge Euro Trophy welcomed almost 120 participants from around the world to the first edition of the 2018 series at the 1,360 metre circuit of Karting Genk – ‘Home of Champions’ in Belgium. The three-day international event was run under summery conditions, while fans both trackside and watching anywhere on the livestream, experienced exciting racing action in all four categories – Junior MAX, Senior MAX, Rotax DD2 and DD2 Masters. Although there was a brief thunderstorm on the final day, the RMC Euro Trophy enjoyed a fantastic kick-off. The 41-field Junior class displayed a well-balanced competition, already evident from Saturday’s qualifying session. With 37 of the young drivers separated by a gap of less than one second only, it was Kris Haanen (JJ Racing) at the top of the timesheet who established the benchmark. In the heat racing, the Dutchman confirmed his form to defend the lead position in the overall rankings. However, the tide turned for Haanen in the finals on Sunday, when he dropped back in the last race and failed to play any decisive role for podium positions. Kobe Pauwels (Daems Racing) took hold of the reins in the first final, with the local hero taking victory by a gap of 0.206 seconds ahead of Dutch driver Mike van Vugt (JJ Racing) and Mads Riis (RS Competition) from Denmark. In the closing final, Pauwels showed his confidence and excelled in the slippery conditions following an earlier shower of rain. Unfortunately, a post-race penalty for technical non conformity omitted the Belgian. This meant that Sem van Til (Intrepid) inherited the race victory ahead of his fellow countrymen Mike van Vugt and Colin Caresani (JJ Racing). In the total ranking for the day, Van Vugt prevailed as the Junior Max winner, with Van Til then Caresani in second and third place respectively on the podium. With 47 entries, Seniors marked the largest grid of the weekend. In the beginning, it was the Belgian Nick Cuppens (Daems Racing Team) who set the fastest lap in qualifying by an impressive time of 54.748 seconds. He dropped down in the points by the end of the heat racing and opened the way for the Brit Bradley Barrett (Dan Holland Racing) and another local favourite Dylan Lahaye (Exprit). Barrett and Lahaye set the pace in the initial stages of final 1, but then collided and lost all chances of a good result. Hannes Morin (Dan Holland Racing) took advantage of the incident, with the Swede assuming the lead and defending his position to the chequered flag. Mick Nolten (Exprit) followed in second place, missing out on the win by just 0.069 seconds, while keeping Max Timmermans (Tony Kart) behind him in third place. In the second final, there was no stopping Timmermans, grabbing the lead and surging away from his opponents for a clear victory ahead of Hannes Morin and the Swedish lady Mathilda Olsson (Strawberry Racing). Morin collected the most points in total and was rewarded with the winner’s trophy ahead of Timmermans and Nolten. In the 2-speed gearbox category, Martin Mortensen (RS Competition) turned on a brilliant performance. The Dane was unbeatable to post best time in qualifying, pole position after the heats and two victories in the final races, making him the outstanding driver of the weekend. Behind the dominant winner, Germany’s Maxi Fleischmann (FM Racing) did a remarkable job as well. Although an oversight in selecting the regulation fuel resulted in a heat race DQ, Fleischmann fought bravely in the finals Sunday and managed to claim second place in both, thus taking the same position on the podium. The battle for third saw Xen de Ruwe (AKK Sportstil) from Belgium and the Finn Roope Markkanen (Flandria Kart Baltics) as protagonists. While De Ruwe had the lead in the first final, Markkanen was up there in the second one. In the daily classification, De Ruwe succeeded and claimed the last podium place. In the additional classification of the Rotax DD2 Masters, Poland’s Slawomir Muranski (Wyrzykowski Motorsport) and Belgium’s Christophe Adams (Sodikart) shared the finals victories. However, Muranski scored better in the daily ranking and consequently won ahead of the former world Masters number 1. The German Michael Becker (Tony Kart) completed the podium in third position. Registration is now open for all competitors wanting to be part of the challenge at round 2 of the European championship taking place at Kristianstad in Sweden from June 8 to 10.